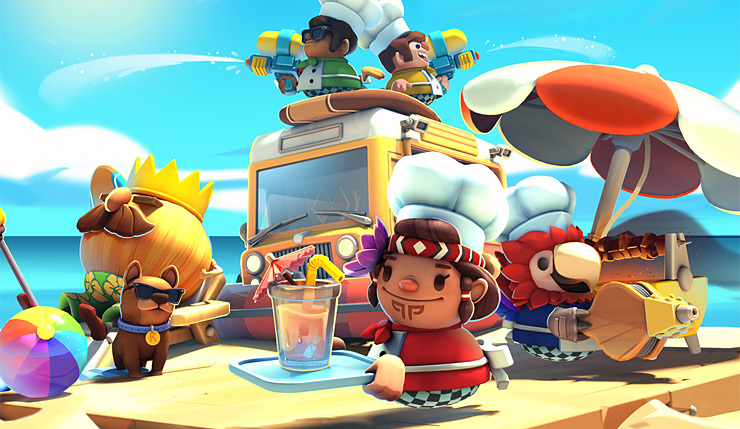 That autumn chill may be in the air, but Overcooked 2 is heating things up with the new tropical-themed Surf ‘n’ Turf expansion! The DLC adds a couple recipes (kebabs and smoothies), 12 new stages, and water guns you can use to clean dishes. Not sure if that’s the most efficient way to clean up, but sure, why not? You can check out a Surf ‘n’ Turf trailer, below. In Surf ‘n’ Turf players will join the Onion King on a culinary island adventure, cooking up new recipes, navigating new kitchens and meeting some colorful characters. Surf ‘n’ Turf serves up 12 brand new kitchens, from the swimming pool to the beach, but don’t get too relaxed as new kitchens mean new obstacles. It’s difficult to tantalize anyone’s taste buds when there’s a tidal wave coming! New Chefs! Three news chefs join Overcooked 2. Parrot chef, Island chef and returning chef, Boof. New Recipes! Blend fruit into refreshing smoothies and BBQ tasty skewers for your hungry islanders. New Mechanics! Who said washing up had to be dull? Blast plates clean with the water pistol. Stoke the fires of your BBQ with the bellows but be aware that the hotter the fire, the quicker your food will burn. Overcooked 2 is available for PC, Xbox One, PS4, and Nintendo Switch. The Surf ‘n’ Turf DLC can be downloaded now for $6.